The extreme paradox found in the feeling of utter exhaustion and yet overwhelming energy has always been a mystery. But it happens. I would know, because I experienced it this weekend! I was privileged to attend the Generation of Youth for Christ conference held in Seattle, Washington, with about 4,000 other young (and young at heart) people. I had a wonderful time catching up with friends I hadn't seen in several years, online friends I hadn't met in person, and friends I didn't even know until meeting them at the convention. The sermons were a huge blessing as well. Listening to several speakers elaborate on how to live Godly lives in a godless society and hearing them advocate the need for a revolution in our lives, made me want to do remain dedicated and faithful to the Commission. Outreach time was a blessing as usual. The meals were good of course and the hotel was superb. But my favorite part of the entire convention was New Year's Eve. As most people prepared for a long night of partying and some people prepared to spend the night praying, a few of us decided to do something totally different. If everyone was going to be downtown partying, why not meet them there and pass out literature? Deciding to do just that, seven of us began passing out GLOW and Signs of the Times tracts and ended up distributing 2,200 tracts to the masses of people gathered beneath Seattle's Space Needle! We scattered the tracts like the leaves of autumn, very likely making a record for having the highest amount of Signs tracts distributed in the same place. We were able to see whole lines of people, thoroughly bored while waiting for the firework show to start, sitting along the sidewalks reading the tracts we had just given them. We got to cheer when another pack of tracts was opened and delivered. We were able to share our unique SDA beliefs with other interested Christians. We placed tracts in every place imaginable where people would find them, including newspaper stands and ATM machines. Inside the Seattle Center the crowds were thick, so we split up into pairs of two and engaged the horde. As we waded through the masses of people, we handed out tracts to everyone we bumped into. While my partner and I walked through a group of people jumping up and down while dancing to the live band, I got a tap on my shoulder. Turning around I saw a teenage girl who I had handed a tract to earlier; she had followed me through the crowd. "What religion is this tract from?" she asked with true interest in her eyes. "We're Seventh-Day Adventist Christians." Confused and puzzled, she asked the question we all love to hear, "What do you believe?" While the wild merry-makers continued their careless capers all around us, I was able to share the gospel with this earnest, seeking soul. GYC challenged me to get out of my comfort zone and do more for God, enabling me to have the best New Year's Eve I've enjoyed yet. When working for God, it doesn't have to be huge, it just has to be something. In case you didn't get that, read it again and let it sink in. When working for God, it doesn't have to be huge, it just has to be something. Share your faith where ever you are. Live the Gospel in your own life so others will see its power. Let's be Revolutionaries and not conform to the lackadaisical attitude of those around us, but continue to press forward so we can all go Home. Soon! The GYC meetings were such a blessing! Passing out GLOW tracts in the market. 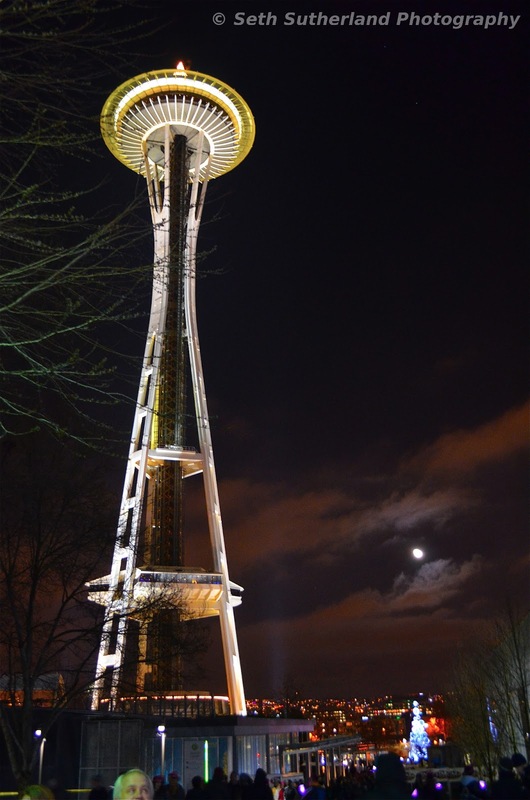 We passed out 2,200 tracts beneath the Space Needle! Yes, it was a huge blessing!! And yes, it was great to be able to catch up again! Sounds like a plan, I'll see you there. Actually though, it's going to be GYC 2014. :D Keep up your good work brother! It was a great experience! Hey Seth can you give my blog a shout-out? I'd love to get a few more interests in it, I'm posting some valuable stuff quite often! Hey Seth! I might just do that sometime. :) What's the URL? Feel free to give a shout-out right here if you'd like!